Jennyopolis is easily among the top five most important cities to Oregon History, but is definitely the least known among those cities. South of here on May 21st, 1852 was the site of Oregon’s first murder. 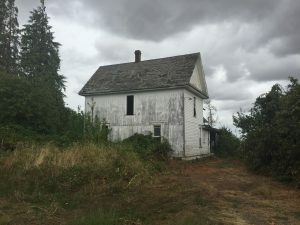 Not even a state yet, the murder of Jeremiah Mahoney by Nimrod O’Kelly for trespassing on his land claim would shape the Oregon Territory and the State of Oregon’s legal procedures and laws. [zotpressInText item=”HXN6442Q” format=”%num%”] The long story is beyond the scope of this post, but Ronald B. Lansing wrote an absolutely fabulous and in depth book about this incident called “Nimrod: Courts, Claims, and Killing on the Oregon Frontier.” It is a must read book if you are interested in Oregon History. The Post Office lasted until April 18, 1857 when it was disbanded to Corvallis. For the next decade, settlers had to take this mail to nearby Starrs Point (now Monroe, Oregon.) In the early 1870’s the Oregon and California Railroad came through this area. Two stations and post offices were built, Rickard and Bruce. Interestingly, both were actually on Nimrod O’Kelly’s claim. These two names supplemented Jennyopolis, which faded into obscurity. 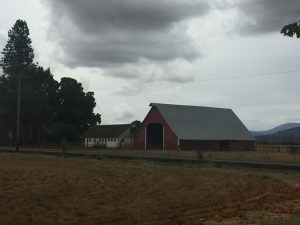 Today, a large farm can be seen on what was the Irwin homestead. No signs of any original buildings remain, everything there is newer then this period. Likewise, the Winkle homestead is also a farm. 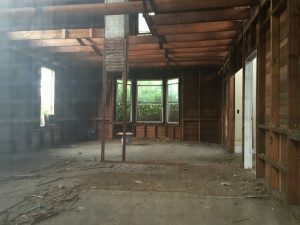 The remains of one farmhouse from the 1920/1930 period remains, as can be seen from the picture below, it has been gutted and looks to be undergoing remodeling. Okay, let the truth be told. I actually do not like reading books!! However, the book, Nimrod: Courts, Claims and Killing on the Oregon Frontier is absolutely fascinating and I could not put the book down! I could pick it up at any time in the next 20 years and be overwhelmed with interest.